Some Brazilian Agate I got for Xmas. I collected some pebbles from the Thames to try an make an Oldawan pebbel tool, had a few spare so decided to see if they could be made into arrowheads. 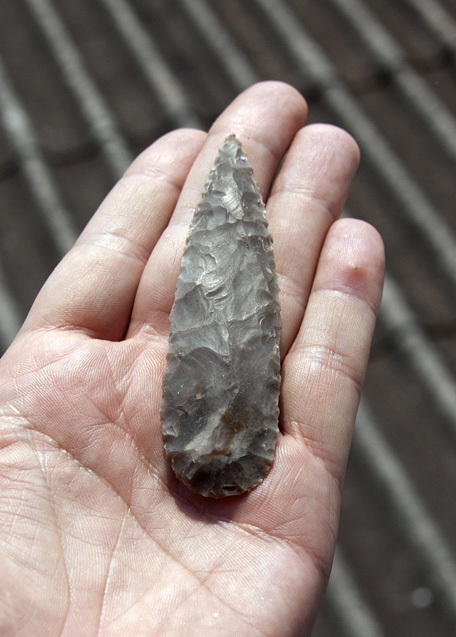 Most difficult Knapping I ever did, never again. Three are from decent NorfolK flint nodules so much easier to knap than the above stuff, the translutent brown stuff from the Thames. Strangest flint I've ever picked up, almost glasslike to knap. See the fossils inside, not often you get to see inside flint. Some knife blades (will most likely never see a handle, I've got dozens from years back, never seem to make the handles), the middle one is obsidian the other two dacite slabs. This is the easiest kind of knapping. Some larger stuff, mostly mahogany obsidian. Anyway, that's the last two months. 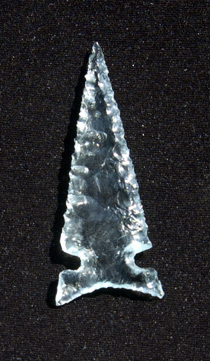 Here's a flint knife I made. A Dalton from Brazilian Agate. 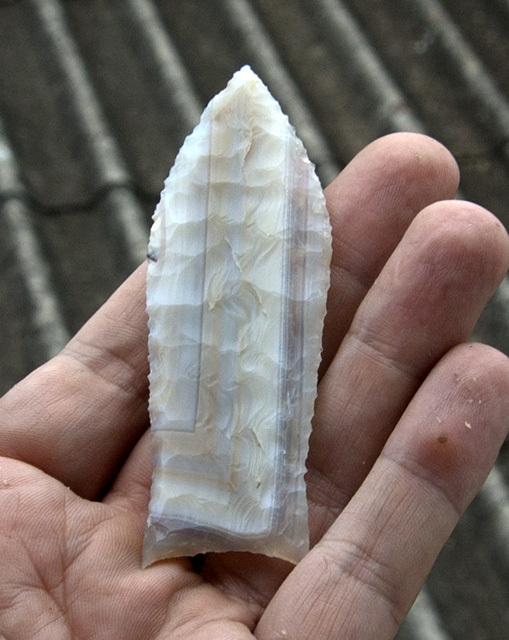 Amazing pattern on the Brazillian Agate, nicely knapped. It's a great material and I found out the other day it's pretty abundant in Britain. Dulcote quarry in Somerset sells the stuff by the nodule. Last night around midnight I heard the shatter of breaking glass, the guy in flat next to me returning home drunk had forgotten his keys and smashed a small pain of his front window to undo his lock. This morning I woke up early and the corridor outside his place and mine was covered in broken glass, a grabbed a couple of likely looking shards (3 and 5 inches long) and by 10am had this. First time I've ever knapped a glass pain. Not too hard but damn slippery when trying to get the pressure flaker to grip.... Not bad for the first morning of the hols. wow you have been busy - can i ask what thickness the glass was? thanks steve. It was 5mm standard window glass. A little thin if anything, quite fragile. Anything thinner would be difficult to knap. 6 or 7mm would've been better. If you bought a small pane one of those hand glass cutters could be used on it get many points out of it.